Posted on February 18, 2015	by Lou Murray, Ph.D. I am experimenting with inserting an Excel spreadsheet directly into my blog (see below, bottom of post). It works so-so. I can’t alter the width of the columns after I paste the image, so the winter chill hours (number of hours below 45 degrees) that each fruit variety requires are kind of quirky looking. Avocado and citrus trees do not require chilling. Our avocado tree is about to burst forth in bloom. In this spreadsheet, I separated the deciduous fruit trees (top of spreadsheet), which require winter chilling to set fruit, from the citrus and avocado trees (bottom of spreadsheet), which require no chilling, and subtotaled them separately. We had good winter chill in 2011-2013, moderate chill in 2014, and a pathetic 76 hours of chilling during the 2014-2015 winter. 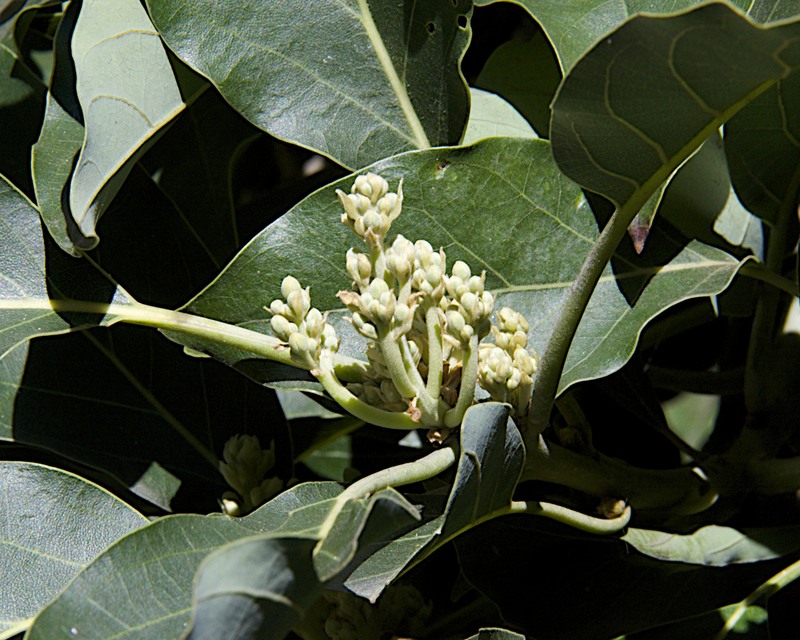 The harvest of fruit from the deciduous trees appears to correlate better with the amount of winter chill than the citrus harvest–no surprise. I am not expecting very much deciduous fruit in 2015 due to the low chill this winter. My August Pride peach has a pathetic 10 blossoms on it, and my Katy Apricot is blooming early with very few blossoms. The Asian pears, apples, nectarines, and Babcock peach are still dormant. 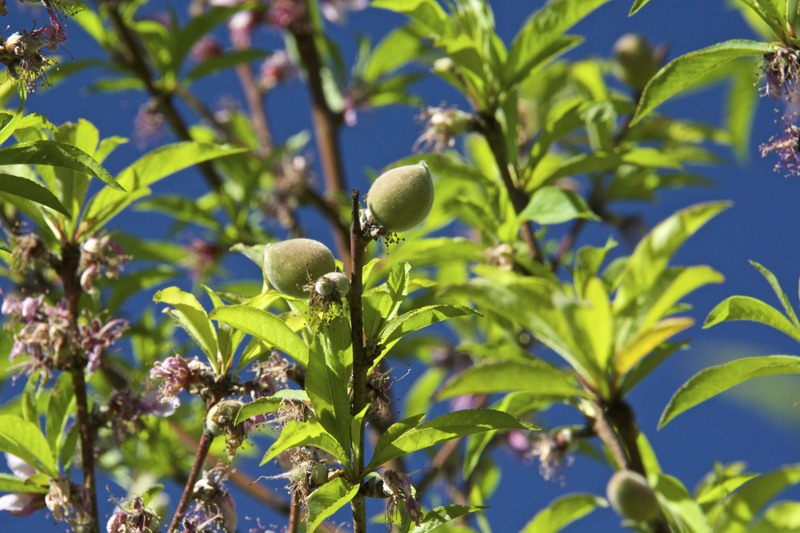 Our Florida Prince peach tree has nearly finished blooming, and is setting a good crop of peaches. Most of my fruit trees were planted 2007-2014. Some (persimmon, pomegranate, Gala apple) are too young to bear fruit yet, and some have not yet reached their good bearing years. And some years the birds and night critters get to the fruit before I do. So this is an experiment in progress. 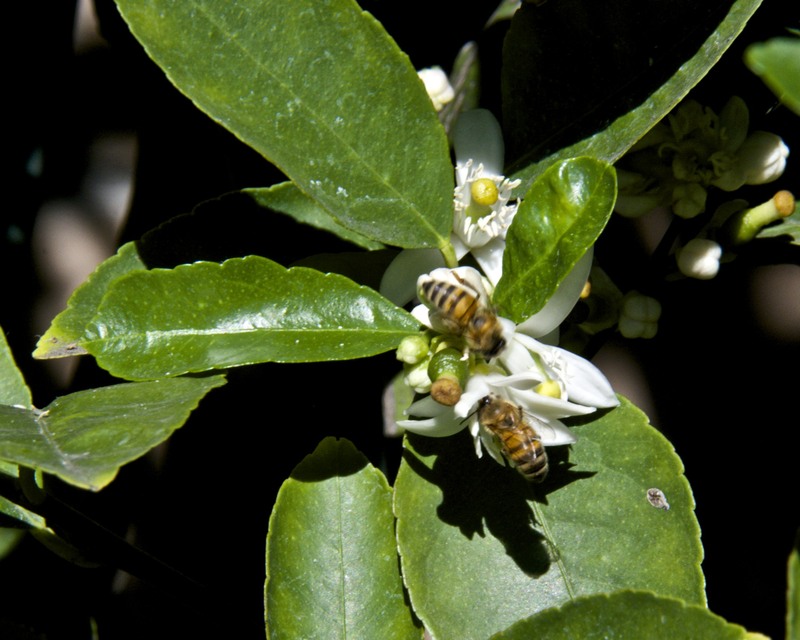 Bees are busy pollinating our lime trees, which are currently in bloom. The lemons and oranges aren’t far behind the limes. I hope you can see the chill hours in the Required Chill Hour column. My conclusion, based on very limited data and a lot of speculation, is that I can expect the warmer winters brought to us courtesy of global warming to have a negative effect on my harvest of deciduous fruit. This entry was posted in Uncategorized and tagged apple, Asian pear, avocado, chill hour requirement, citrus, citrus trees, climate change, deciduous trees, Fruit, fruit trees, global warming, harvest yield, nectarine, oranges, peach, plum, southern California, winter chill, winter chill hours. Bookmark the permalink. For us it is the cold and windy conditions which can kill buds that affects how much fruit we get. That and our late freezes. If the weather is perfect when the tree blooms, then we get a good fruit set, otherwise not. Daphne, I’m sure that you get plenty of chill hours in New England. But those early thaws followed by freezes must wreak havoc with your trees. I’m in SoCal too (San Diego) and I’m seeing the same type of phenomenon, although I’d wager we got even fewer chill hours than you state. Anyway, I get the impression my more established trees are adapting better to those lousy winters, do you see a difference between your younger and older trees? Ghislaine, sorry to be so late to reply. My trees are all still fairly young, and I see them bearing more as they get older. I just learned about winter chill hours, so it may be some time before I have any meaningful data on this. The UC Davis website should provide the chill hours nearer to you. The closest one to me is Irvine. That may be the only datapoint for Orange County, not sure. We are nearer the coast than Irvine, so I’m not sure how that affects the chill hours. Do all grapes require chilling hours or certain varieties? Hope you get fruits from some of your deciduous fruit trees. Norma, I am not sure about different grape varieties and their chill requirements. I think they all require at least 100 hours, but I could be wrong. Some might need more. As Daphne said, our issue is usually late freezes but last year I think a lot of my buds were killed off during the winter by the abnormally cold temps. This winter seems to be no different and looks like we are heading towards a record breaking February with lows well below what we normally get. So even though it is for completely opposite reasons, looks like I may also be headed towards another fruitless (or very sparse) year. Margaret, I hope your fruit trees survive the cold winter.